Helen is big-hearted and determined, someone who wants to make a better life for herself and for her community. A recent graduate of the Gondor University, in Ethiopia, she is currently employed by the NGO that provided the love and support that she needed when she was a young child. 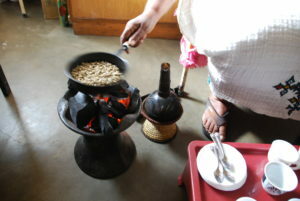 She is grateful for that love and support and wants the opportunity to share it through the ancient Ethiopian tradition of preparing and serving coffee. Both of Helen’s parents passed away when she was a young child. Helen and her brother were left with only their stepmother, who provided a roof over their heads but was unable to provide much more than that. With great intelligence, grit and determination Helen and her brother identified and contacted an NGO that provided group homes for orphaned children. The NGO accepted Helen into the residential program and supported her and her brother in getting an education. Helen says that it was hard to get accustomed to living with seven other children and to be separated from her brother but the support she found in the group home was much more than she ever received in her stepmother’s house. 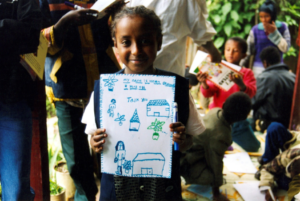 It was through the NGO that Helen was introduced to an Ethiopian adoptive family in the US. Helen was seeking ways to improve and practice her English and the adoptees a way to connect with her Ethiopian heritage. What began as a pen pal relationship, turned into a rich cultural exchange and ultimately an expanded sense of family for all. During high school Helen took the brave step to become an exchange student in the US with her pen pal’s family. 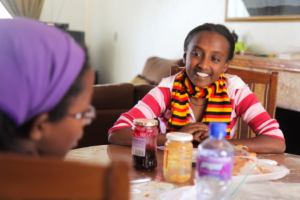 While there she was diligent in her studies and took the opportunity to mentor several Ethiopian adoptees. Her influence on these children endures. She instilled in them a deep pride in their homeland and their culture as well as a quiet understanding of the loss they suffered early in life.